If you'd prefer to print and make them yourself, select printable from the drop down & use coupon code PRINTABLESHIPPING to remove shipping cost at checkout. They arrive ready to use, just put into your ready to eat cupcakes. See below for more custom details! ✔Select how many you need under "How Many Toppers"
✔Check your mail in a few days for your toppers, ready to use! ✔If you'd like the personalized PRINTABLE version (12 per 8.5x11" sheet to cut out and make yourself), select from the drop down and use coupon code PRINTABLESHIPPING at checkout to remove shipping cost. Worked with me to get exactly what I needed in Spanish. Great customer service! Sent me proof super quickly!! super fast turnaround! very please with the digital print. Most of my items are personalized, make sure you include your personalization in notes to seller at checkout. If you forgot, send me an Etsy message with your personalization information right away. If your item has a photo, please send it via Etsy conversation as well. Most personalized items are proofed first, and your proof will come within 24 hours, normally same day. It will come through your Etsy conversations messages, so make sure you log back in and check it within 24 hours. Do not reply to an email, you need to log into Etsy messages to respond. You need to look it over carefully for any errors, I recommend on a computer and not on your phone. I do not check for typos or do any copy editing, so it is important that you do this yourself. Once approved, I can not make any changes because I may have already laid it out for my press. If I do not hear a response to a proof within 2 days, your order will be considered approved and begin processing. All sales are final, due to the personalized nature of my products, I can not offer returns or refunds for any items. It is important you check your proof carefully for any typos, I do not copyedit what you provide. If I make an error on the product after you have approved the proof, I will fix it. Because I can not control the quality of other printers, I can not offer any refunds on digital purchases. If there's a problem with the quality of print where you are printing it, I can convert your file to a printed order, as I provide fast, high quality printing! Due to the time it takes to create your design, a cancellation after I have designed your item & sent a proof will incur a non-refundable design fee, a minimum of $18.99. Read shop announcement for any delay information. Business days are Monday-Friday. Shipping methods are always in addition to processing time. I observe US Government observed Holidays, USPS and Fed-ex does as well. Digital files are proofed/delivered within 24 hours - 7 days a week. USPS does not guarantee their transit times. Please upgrade to -Fedex 3-day guaranteed - it is 3 business days if you're concerned about the timeframe. The 2-day & overnight options are based on a generic transit location, you may contact me for a quote to see if it's cheaper, just let me know your address and what your order contains. I do refund the overage (if any). Ask me if you have any questions please! The default shipping method is USPS Priority mail, if you'd like the Fed-Ex 3-Day Guaranteed, contact me with your address for a shipping quote, as Fed-ex does not service all locations. Items ship via USPS Priority International; you can check out their website for better transit times for your location, but most countries average 10-14 days. It is important to make sure your shipping address on Etsy is correct, any returned packaged due to an incorrect address will need to be re-shipped at the buyer's expense when it returns to me. I appreciate your business, and I promise to work hard at making your item just how you'd like it. In return, please be courteous to the time it takes to design your item and please check your order for typos, before you submit. Custom orders are always welcome, let me help you make your dream products become a reality! Files sizes are not interchangable, if you order a particular file size, it is proofed, and then you change your mind, they are not able to just be changed to another size, they have to be re-designed on another size layout, so you will need to place another order for a new size design. My items are personalized, make sure you include your personalization in notes at checkout or send me an Etsy message with your personalization information. Once a proof is approved, no changes can be made, no exceptions. Turn times are advertised on the listings. Business days are Mon-Fri. If a proof is not responded to within 2 days, they are considered approved and proceed to production. Shipping cost includes Priority Mail 2-3 day advertised transit for most orders. Turn time for most products are advertised from proof approval + shipping transit. Upgraded options are available if you're in a rush, turn time is still advertised days for production + shipping time. The upgraded options are based on a generic transit location, you may contact me for a quote to see if it's cheaper, just let me know your address and what your order contains. Ask if you have questions please. The default shipping method is USPS Priority mail, upgraded options are for contiguous US only - if you'd like a faster method, contact me for a quote. Items ship via USPS Priority International; you can check out their website for better transit times for your location, but most countries average 10-14 days. It is not considered lost until 45 days to file a claim. If you'd like to quote a faster transit, contact me with your information. Digital Orders - JPG or PDF? PDFs print the best quality; however, you will need a PDF viewer on your computer to view them, and not all printers will accept PDFs. Both are 300dpi print-ready files. You need to contact your printer, and ask them if they can accept JPG or PDF? Files do come with 1/8" extra image bleed on all sides which is standard for printing companies. If some reason they do not want a bleed, just let me know and I'll send it without the bleed. Note that not all print locations use the generic sizing. If you order a 5x7" and a company only prints 5.5x7" for example, your file will not fit their layout. It is important for you to find out requirements from the printer before purchasing, there are no refunds on digital files. What are 'generic samples' in each listing? These are samples of the product, not personalized, printed the same way & same stock that you would receive if you place a full order. This is helpful if you're looking to place a large order and want to have the feel of a sample in your hand before spending a large amount of money. They are shipped via USPS. Most of the time, I can do this! We will need to discuss the expectations ahead of time and there will be a custom listing made for your item(s). I do send proofs before finalizing any custom designs. 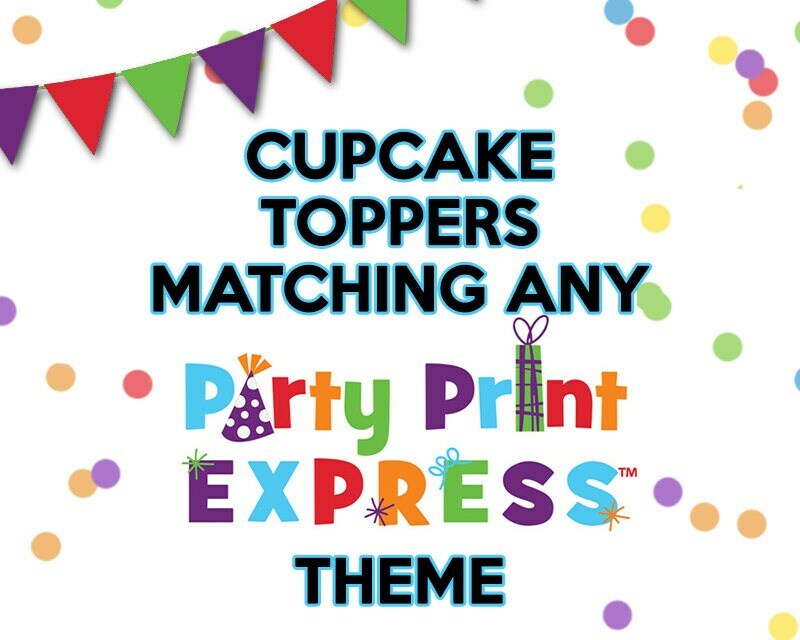 Note that Party Print Express retains the ownership and copyright for all designs, and they can be resold at my discretion. If you'd like an exclusive design, please let me know when we're discussing the quote so I can quote it for an exclusive-only design. Due to the time it takes to create your design, a cancellation after I have designed your item will incur design fees, a minimum of $17.99. What stocks & inks do you use? Each listing has the stock used for that item. Most invitations are on 100lb gloss cover. I do offer upgraded stock choices to uncoated, linen, high-gloss (looks 'wet'), and more. Each listing with a stock upgrade has a link in it to the stock upgrade location. All of my papers have a minimum 35% recycled content, and are 100% recyclable. I print CMYK (4-color process). My inks are all linseed oil based (plant) and any coatings are water-based (Aqueous). NOTE ABOUT COLOR: Due to the wide variety of monitor calibrations and settings, the color you see on your screen may be different from the actual color printed. Monitors view in RGB display, and prints are made in CMYK format. All of my packages are insured; if your item arrives damaged, DO NOT DISCARD! Send me photos of the packaging and damaged items, and retain all pieces for USPS inspection for the claim.